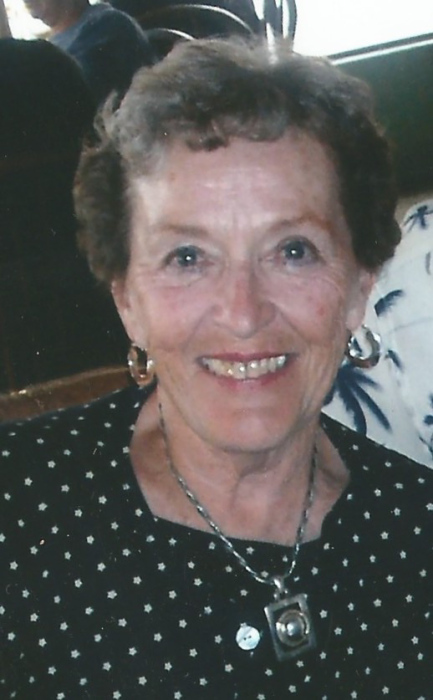 Elizabeth Jane MacKillop (nee Everard) of Sylvania, Ohio passed away peacefully on September 13, 2018. She is survived by her husband, Frank MacKillop, her daughter Patricia Marshall (Brian), and her sons Steve MacKillop (Lori), Tom MacKillop (Lisa Farris), Dan MacKillop (Mary Czinski) and Jim MacKillop (Terri) as well as 15 grandchildren and 1 great grandchild, brother, Jack (Kitty) Everard, in-laws: Dez (Marguerite) McAlister, Al Erwin, and James Mackillop. She was predeceased by her daughter Jane MacKillop and infant son, Ricky. Betty or "Betts," as she was known by her friends, overcame many early hardships and losses and went on to build a loving family, a warm, welcoming home and a long, rich life that she loved. She was 87 years old when she died and remained remarkably sharp and independent until just before the end. In fact, just a week ago she was still asking for her car keys. She will be missed by all of us, but mostly by her husband of 66 years, Frank. Theirs was a great friendship -- whether they were playing a round of golf, discussing the latest book on current events, or hanging out at the Hutchinson Island beach where they were happy to spend a decade as snowbirds. In fact, Betts and Frank showed us all by example how to be true companions to each other. Betts also loved gardening, golf and tennis -- often giving her kids a run for their money on the courts. She was, in fact, quite the athlete. She learned to ride a bike at 20, to swim at 30, play tennis at 40 and to golf at 50. Her claim to fame was a hole in one in 2009, and despite her declining health, she still managed a round just last summer. Betts delighted in her 15 grandchildren and made sure their childhood Christmases at her house were magical, complete with her collection of Santa's and more holiday cookies than anyone could possibly eat (although many tried.) Halloween was also a big grandkid event, as she donned a costume every year along with the littles for the Highland Meadows party. Most of all, she was our Matriarch -- ready to support us, to listen to us, to be there when we needed a shoulder to cry on or wanted to celebrate one of life's joys. She was always there to love us. We will miss her forever. Memorial Services will be held Tuesday, September 18th from 3-6 pm at Reeb Funeral Home in Sylvania OH.